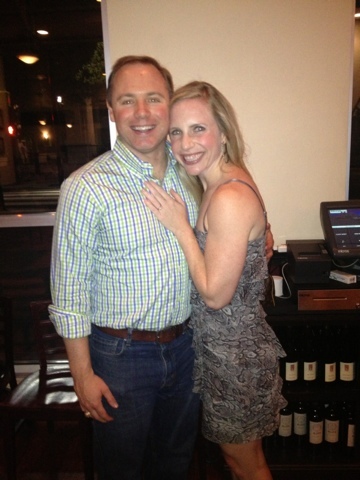 Olivia Margaux: Josh Proposed, and I said...YES!!! 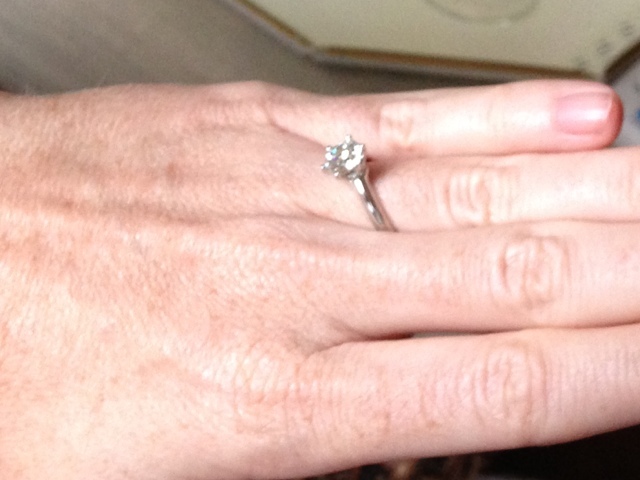 Josh Proposed, and I said...YES!!! For the past few weeks, Josh had mention that he would like to take me to dinner to thank me for taking care of him when his ankle was broken. He said I could pick anywhere in the city, and we would go. This girl always loves a good steak, and I decided that I had my heart set on Rays the Steaks. He made the reservation and told me we would go on Saturday. We planned to go to church, come back to my place for some champagne to toast to Josh's health, and then head to the restaurant to stuff ourselves with red meat. It ended up being kind of humid and rainy late in the afternoon*. So instead of getting completely ready for dinner before church I decided to fix my hair when we came back to my house for champagne*. For a little background knowledge about me, I use hot rollers anytime I fix my hair. I normally put them in and then do other things while I wait for them to set: drink coffee, make my bed, watch tv. Well Saturday night was no different. 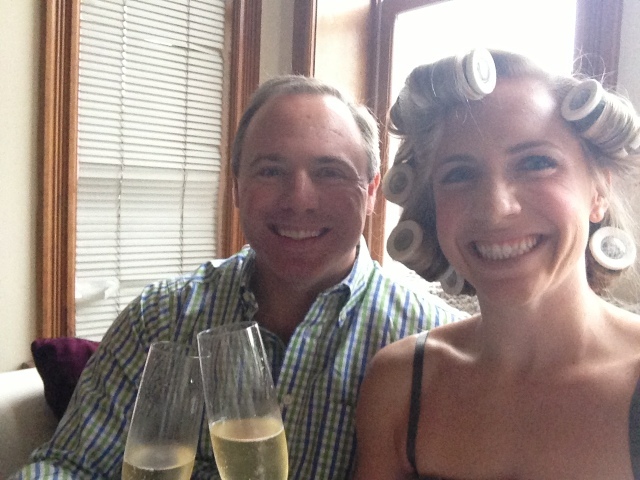 After I got my rollers in my hair, I wanted to hangout in the living room with Josh and drink the champagne that we had bought to toast his now healthy foot. While I had been fixing my hair, I noticed that Josh had been acting a bit funny. At one point he was walking around my room, and when I asked him what he was doing he started to fluff my bed. Weird, and not normal. Then later when I was about to come join him in the living room I kept hearing him rustling around*. Again, not normal, but I still didn't suspect a thing. I just asked him what he was doing and told him to pop the champs! Toasting! I took this picture specifically for my weekend recap blog. I even said "for the blog" before I took it. Little did I know what was going to take place moments later. We were drinking and chatting, and he was a bit jumpy. He kept telling me all the reasons he loved me specifically that he loved watching me get ready/seeing me in my curlers. I told him that he was making me nervous because he was acting funny, and so he told me I was right. I had caught him. He told me he had hidden a note in my room, but since I had caught him I could have it then. It was the most beautiful card and he said such wonderful things that I started to cry. We toasted again, and I thought ok...that is why he was being so weird. We were visiting some more, and then all of a sudden a Nora Jones song came on. On our first Valentine's Day together Josh and I cooked, drank wine and pretty much listened to Nora Jones on repeat. He then told me he had one more surprise for me and grabbed a Pacers running store bag out from under the couch. At first I thought maybe he had gotten me some CF stuff, but the second he handed it to me I knew. Whatever was inside was heavy and square. I starting going "oh my gosh oh my gosh" and Josh kept saying "what what". I put my hand in the bag and pulled out a turquoise box, and I instantly started crying. Josh was still going "what what". I opened the box and inside was a ring box. Josh then took the box from me, got on one one knee, and said wonderful things again. I was bawling, I said yes, and he put the ring on my finger. We had never really discussed what I wanted, and he couldn't have picked a more perfect ring! 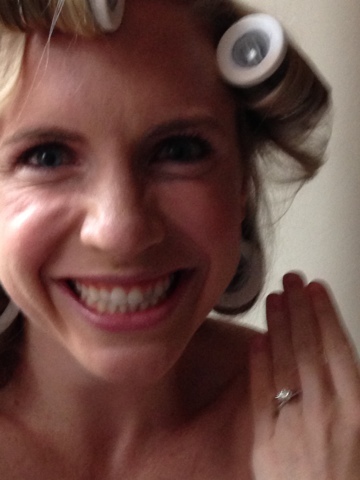 Still in my hot rollers, but the happiest girl in the world! *Later Josh told me that he had all of these plans for the engagement. He wanted to go down to the Capitol and propose there, and when I left my hot rollers in and it started raining he thought about waiting and asking me later. But at church the Priest gave a homily about marriage and then when Nora Jones came on he said he knew he had to do it then. I am so glad he did, because I could not have asked for a better proposal. I loved that we were alone and it was so intimate. He made it so special, and I could not be happier. After some more crying (all happy tears from me), laughing, and calling our parents (who were all ecstatic), we finished the champagne. I finally took out my hair rollers, and we got in our Uber to go to dinner. While in the car, I called my roommie Alycyn to tell her the good news. While leaving her a voicemail, our Uber driver went crazy with excitement for Josh and me. He gave us hugs when the ride ended, and it just added to the spectacular vibe the evening already had. At dinner, we feasted on foie gras, crab bisque, steak and chocolate mouse. Josh had called ahead, and we were given complementary champagne and Josh ordered a fantastic bottle of wine. We left feeling full and happy but decided even more champagne was needed. We were celebrating after all! At the end of the evening. 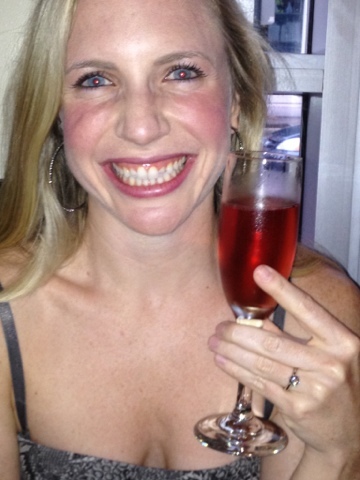 I had wine teeth and could not be happier! Josh and I are so appreciative for all of the love and support we have received from everyone. It is beyond humbling to have such a supportive network of loved ones, and we were excited to share our special news with everyone. Thank you for all of your congratulatory words and well wishes. We are beyond blessed! 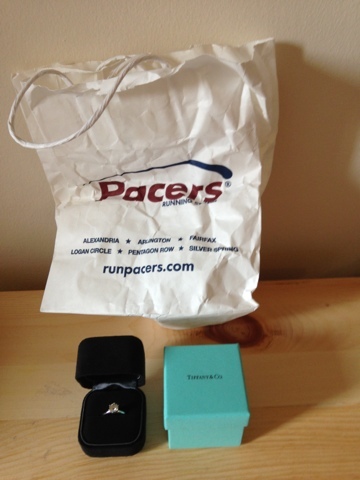 My ring and the Pacers bag...pictures do not do it justice. And I am one happy girl! Thank you Frannie! Love you bunches! LOVE this post, Olivia!!!! Couldn't not be happier for yall! I need to come to DC to help you celebrate!! Thanks you Mary!!! I really have been looking forward to joining the link-up! Best blog post EVER! :) It made me tear up all over again. So happy for y'all!! Congrats! You guys are so adorable and that RING! Oh wow! Good job Josh!! Thank you Adrianne!! So glad you are doing well! Congrats! That is so exciting! And to get a ring from Tiffany's is even better. Such a sweet proposal story! I love it! Thanks so much for linking up with us today! Thank you Kristyn! I have been looking forward to joining yall, and I will be back! Congrats on your engagement! And what a fun proposal! I had absolutely no idea my husband was getting ready to propose, although looking back on it, a lot of the signs were there. So I probably should have figured it out sooner, but still loved the way it worked out. Olivia I couldn't be any happier for you! Beautiful story!